Two Tory peers have joined the UK Independence Party (UKIP) in protest at the Conservatives' lack of a "sufficiently Eurosceptic policy". Lord Pearson of Rannoch, who switched with Lord Willoughby de Broke, said UKIP was the "only party telling the truth" about Europe. He also said they had given up hope that the Tories would "toughen up on immigration, tax, education and so on". The defections give UKIP its first Westminster representation. Lord Pearson described the Conservative leadership of David Cameron as "going in the wrong direction". "UKIP is the only party that is telling the British public the truth about the worrying relationship with the European Union, which is getting worse by the day," he told BBC Radio 4's Today. "We want to put our country, our self-governance, our democracy, our sovereignty, before the interests of the present Conservative leadership." Lord Pearson, who has raised funds for the Conservatives in the past, said he hoped to continue that role for UKIP, especially as "it needs money". "I hope there are a number of party donors who will see that the only way they can help to persuade the present Conservative leadership to make sense is in fact to give money to UKIP," he said. He also said there were "several" other peers who were considering joining UKIP, and nine MPs had signed up to the Better Off Out campaign to get the UK out of the EU. UKIP leader Nigel Farage said: "I welcome these defections which come on top of many senior Conservatives who have joined us in recent months and I predict many more to come." 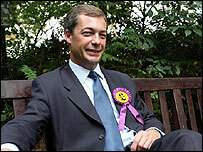 UKIP it won 12 seats in the European Parliament in 2004 but it has yet to gain an MP at Westminster. A Conservative Party spokesman dismissed UKIP as a "fringe party" and said: "[Tory leader] David Cameron has made clear that Europe must change and confront its failings and that a future Conservative government would stand up for Britain's interests in Europe and vigorously oppose the constitution". Mr Cameron has been engaged in a war of words with UKIP since taking over as Conservative leader in December 2005, as the smaller party attempts to poach its members, councillors and MPs. Some Tories, including Lord Willoughby, are angry that Mr Cameron has not delivered on a pledge made during his leadership campaign to take the party out of the federalist European People's Party group in the European Parliament within months of taking over. A small group of Conservative MPs are now openly campaigning for Britain's exit from the EU and UKIP has pledged not to stand against them at the next election. Meanwhile, earlier on Tuesday, Mr Cameron met the Christian Social Union party's leader Edmund Stoiber in Bavaria. He said there was a "positive agenda" for the EU but warned against attempts to revive the EU Constitution, which has effectively stalled after being rejected by French and Dutch voters in June 2005. "The Conservative Party will not support a constitution that is about transferring more power to the EU," he said.